Welcome to First Lutheran Church (FLC). Thank you for taking time to learn more about our faith community where we strive to put Christ first in everything we do. We hope you'll come live, love, laugh and learn with us and visit FLC soon! We offer two worship service choices each Sunday at 8:30 and 10:00 am. There is a staffed nursery available at both services. Our Traditional 8:30 am service is more liturgical featuring the Moller pipe organ and often the FLC Choir. The 10:00 am service, known as our Celebration service, is led by a contemporary praise group accompanied by a live band. Most services utilize a projected screen. During holidays and various times of the year, there are special Festival services. Different music groups offer anthems during both services. The 8:30 am service is more traditional and people dress in business casual and casual attire. The 10:00 am service has a more relaxed atmosphere: Come As You Are! We have two parking lots. The larger main parking lot is accessed from Fourth St. The smaller lot, known as the back parking lot, is accessed from Fifth Street. If the lots are full, you can park on the street or near the school. There are two main entrances that are most commonly used: the front entrance and the carport entrance adjacent to the main parking lot. If you are coming through the front entrance, go straight to enter the Sanctuary. 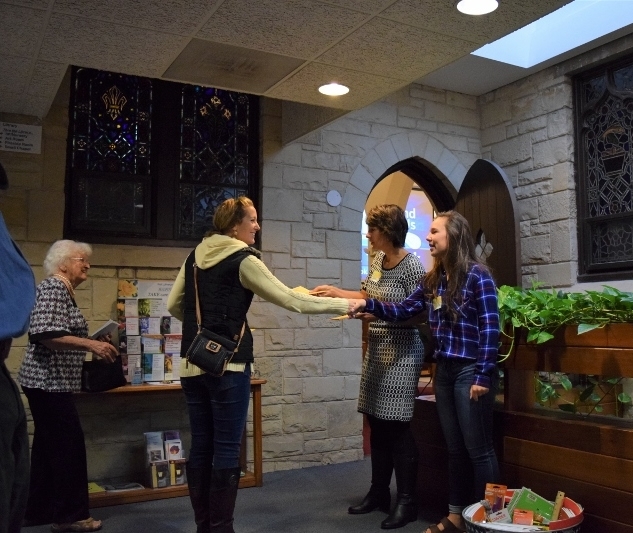 At the Sanctuary doors, you'll be welcomed by a friendly smile from the greeters and ushers able to assist you. If you are coming in from the carport entrance off the main parking lot, you'll be greeted by an usher at the door. Go up the stairs and continue straight. You will be welcomed in our Atrium by friendly greeters and ushers. If you need an elevator, come in the carport entrance and proceed down the ramp. Go past the hallway to the second opening and the elevator will be on the right. If you have children, preschool age through 4th grade, they can join the First Kids. They meet at the beginning of the service hour in the Openings Room, or 4K class. They begin all together with singing and then move into smaller groups. After service they can be picked up on the lower level in Fellowship Hall. If you have students, who are in the 5th or 6th grade, they can join the 56ers. These youth start the service in church with their parents and then leave for their class after the Prayer of the Day. A teacher is usually waiting outside the sanctuary for them. All other youth, 7th grade and older, are encouraged to attend service with their parents. There are signs located throughout building to help guide you through the church. As you walk into the Sanctuary, you will be greeted and handed a bulletin which guides you through the service. All hymnals are provided and prayers and liturgies are printed in the bulletin. For the second service, all words to the songs and prayers are printed in the bulletins and projected onto a screen for your convenience. If you need hearing devices, please see an usher. We have some hearing amplifiers that we will be glad to loan to you during your visit. If you forgot your reading glasses, please feel free to pick up a complimentary pair from our Information Center, a small alcove just outside the back of the Sanctuary. Check out the Information Center and take a Welcome Bag home to enjoy. Then join us in the lower level Fellowship Hall for coffee, tea, cookies and good company. We would love to meet you! Check out the frequently asked questions here. Still have questions or would like some more information? Please contact us. You can also find out more about what's going on at FLC through our newsletters. For weekly e-newsletter, an email address must be submitted. For the monthly newsletter, an address must be submitted.